Since the launch of PARS we have received thousands upon thousands of voucher photos, many of which are outstanding examples of wildlife photography. Among these, certain photos stand out, whether it be for exceptional clarity, composition, behavior of the subject, or other reasons. We would like to start showcasing the quality of our best photographers with an annual photography contest. Entrants in the categories listed below will compete for 1st, 2nd and 3rd place awards, and winning photographs will appear in the last newsletter issue of each year until 2022. First place winners may see their winning photographs in or on the cover of a future PARS newsletter, or possibly in the final publication for the PARS project. One photograph will be chosen as the ‘Best of Show’ grand prizewinner each year. Photographs will be judged on composition, creativity and clarity of the shot. Prizes are limited to certificates and ribbons, but you will achieve the esteem of the herping community. Species Representation ~ These photos should be approached as though they were going to be used as a field guide representation of the subject. Adult, juvenile, larval and egg stages are all acceptable, but only two photos of each species may be submitted. Behavior – Action photos showing a specimen (or specimens) engaged in a natural activity such as feeding,courtship, etc. Herps in the Landscape – Photographs illustrating an amphibian or reptile in a classic natural landscape setting. Macro Photography – Close-up photos of any portion of an amphibian’s or reptile’s body. Free Form / Experimental – Have the urge to submit a photo in which you changed the color of a Green Frog to electric orange? This fun category is for you. Deadline for photo submission in this year’s contest is August 30 , 2016. Winners will be announced in the Winter2016/2017 newsletter, which will also showcase the winning photos.. 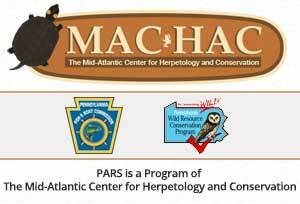 Registered PARS participants only, including all volunteers, coordinators, land-owners, MACHAC and PFBC personnel. Participants will retain ownership of their photographs, but by submitting agree to allow MACHAC to use the photographs in any of its future publications. Animals should not be unduly stressed or abused to obtain photographs. Photographs must be shot on location where the animal was found, preferably within Pennsylvania’s borders. How Many Photos Can Be Submitted? Each year, two photographs for each Pennsylvania species may be submitted in the Species Representation category, and one photograph may be submitted for each of the other categories. Submit using the online form here. Only one species should be included in each email. In the email text please state the species and category of entry for each photo. Photos should be labeled with the last name of the photographer, a hyphen, the species name, photo format, and a number if two photos are being submitted for the same species. Example of two spring peeper photos submitted: poston-crucifer1.jpg , poston-crucifer2.jpg . Format for final photos: high-resolution JPG or TIF. Photos should be smoothly pixilated even at 100% zoom. How well the individual represents the Pennsylvania phenotype or morphology of the species in the ‘Species Representation’ category. No dead animals (e.g., roadkill). Hand-held or captive is acceptable if the hand (or net or container) doesn’t show in the photo. Animal should comprise > 50% of the photo. Photographs are donations, not purchased. No prizes for this contest are awarded other than certificates and/or ribbons. You will receive credit for each photo published. You will retain legal rights for future use of your photographs. You will be required to sign a release form that grants MACHAC and the PFBC the rights to use your photograph in any of their future publications, including electronic. Participants under the age of 18 must have a parent or legal guardian co-sign for them. Final size and cropping will be determined by MACHAC.